The old sizes of vintage are not the same as modern sizes. Also, different designers have different sizes. Compare the measurements of a similar item you already have to the one you see on our site. Remember, our measurements are approximate (using measuring tape), not exact sizes. 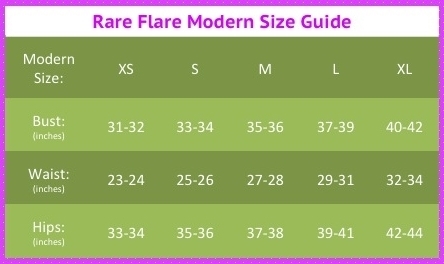 Please refer to our Modern Size Guide located below. We aim to measure as accurately as possible. Measurements are taken while the fabric is laying flat. Keep in mind our listed measurements are of the garment itself and you will need to account for comfort in your measurements. When measuring for fit, please follow the instructions for item type below to ensure your measurements will work. We measure items in their un-stretched state (if it stretches). Dress length is measured from shoulder to hem. Bust/chest measured from underarm, across the chest to the other underarm, then measurement is doubled. Waist is measured across where an average waist falls, then doubled. Hips are measured across where an average hip falls, then doubled. Skirt length is measured from waistband to hem. Arm length is measured from shoulder seam to wrist hem. Length is measured from shoulder to hem, or straight down the back not including collar. Waist is measured across where a normal waist would fall and then doubled. Back is measured from shoulder seam across to other shoulder seam(see diagram below). Inseam is measured from crotch down along inside of leg to hem. Waist is measured across natural waist then doubled. Sometimes we measure from the waist, down to the crotch if needed. Shoes are measured lengthwise across the top of the shoe from the heel to the toe. Width is measured across the sole at the ball of the foot.